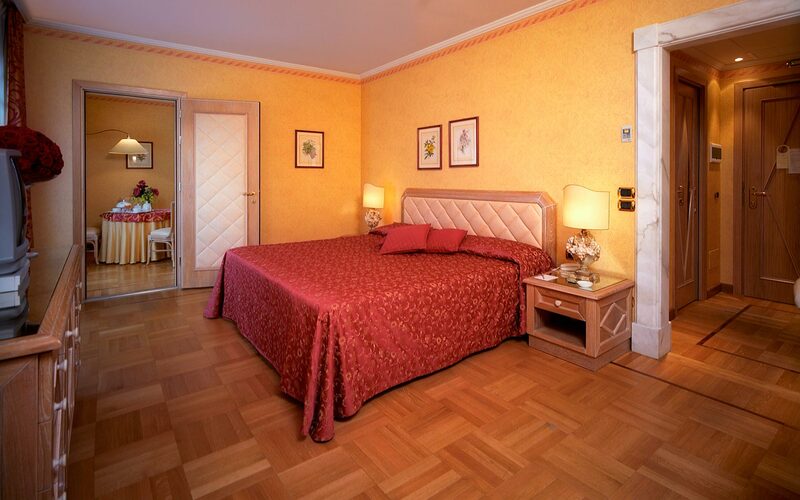 The rooms of our hotel in Versilia are spacious and comfortable. 62 rooms all furnished with the greatest attention to details, to create a unique environment in which style and comfort blend together in harmony. Every room is the result of a skilful combination of elegance and refinement, with their precious interiors, warm colours and fine quality fabrics that make the environment perfect and exclusive. All rooms of our hotel in Versila have parquet flooring and the bathrooms are tastefully decorated with grey and white precious Carrara marble. Outside the rooms you can enjoy the magnificent landscape that embraces the hotel, with balconies and terraces looking out onto the greenery of the park and the blue sea. The Hotel offers four different types of room, each unique in every detail. These large, bright spaces are furnished with style and elegance, making our rooms a romantic retreat for loving couples or comfortable accommodation for all the family. The Classic Room, located in a separate building named “Torre”, is a few steps away from the main one named “Villa”. The structure presents Neo-Renaissance features that can be attributed to the Middle Ages, such as the bell tower, the pointed arches, the facade-facing bricks. This is a medieval revival but faithful to the monuments of the time, especially to the Pisan and Florentine areas. The “Torre” was the ‘dependence’ of the Senator’s guests located behind the main Villa offering rooms characterised by typical décor and handmade decorations. The Superior Room, located in a separate building named “Fattoria”, is a few steps away from the main one named “Villa”. The “Farmer” structure, while reproducing medieval elements, is lightened by the plastered perimeter. It is designed with decorative motifs all in succession with the contribution of Galileo Chini; famous painter, decorator and graphic designer. The Deluxe Room is located in the main “Villa” building. From the early 1900’s, the Villa served as the former residence of the Rolandi Ricci Family. The building is composed by rooms decorated in Baroque style, the Reception, the “D’Annunzio Restaurant”, the “Puccini Bar” (decorated in Art Nouveau style) and the “Reading Room”. The Junior Suite, located in a separate building called “Fattoria”, is a few steps away from the main one named “Villa”. The “Farmer” structure, while reproducing medieval elements, is lightened by the plastered perimeter. It is designed with decorative motifs with the contribution of Galileo Chini, a famous painter, decorator and graphic designer. The Suite Torre, located in a separate building named “Torre”, is a few steps away from the main one named “Villa”. The Deluxe Suite is located in the main “Villa” building. From the early 1900’s, the Villa served as the former residence of the Rolandi Ricci Family. The building is composed of rooms decorated in a Baroque style – the Reception, the “D’Annunzio Restaurant”, the “Puccini Bar” (decorated in Art Nouveau style) and the “Reading Room”. Giacomo Puccini e Gabriele D’Annunzio loved to stay in these Suites delighted by a wonderful view over the sea. The Modern Room, located in a separate building named “Duse”, is a few steps away from the main one called “Villa”. The “Duse”, recently built, harmoniously fits inside the complex and in perfect harmony with the other structures, thanks to the elegance of its furnishings and precious marbles. The Junior Suite Modern, located in a separate building named “Duse”, is a few steps away from the main one called “Villa”. The “Duse”, recently built, harmoniously fits inside the complex and in perfect harmony with the other structures thanks to the elegance of its furnishings and precious marbles. The Modern Suite, located in a separate building named “Duse”, is a few steps away from the main one called “Villa”. The Family Room, located in a separate building named “Torre”, is a few steps away from the main one named “Villa”. An outdoor swimming pool, a private beach, a wellness room, a gym and tennis courts for an unforgettable vacation!